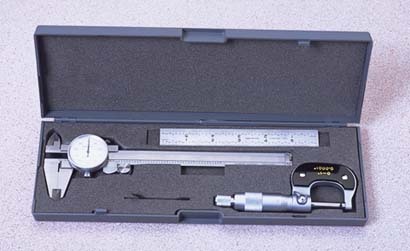 0-1” micrometer with .0001 reading, carbide tips and ratchet stop. 6” stainless steel caliper with .001 graduations, .100 revolution and covered rack. 6” 4r scale: reads in 1/8ths, 1/16ths, 1/32nds, and 1/64ths.